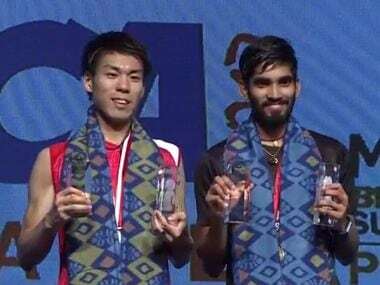 Jakarta: Indian shuttler Kidambi Srikanth clinched his third Super Series title, lifting the Indonesia Open men's singles trophy with a straight-game victory over Japanese qualifier Kazumasa Sakai in the finals here today. 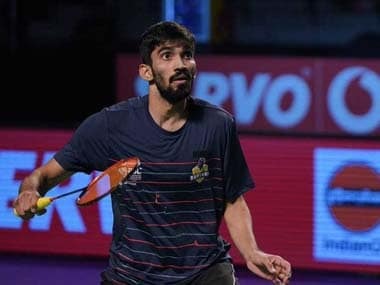 World No.22 Srikanth, who had reached the finals at Singapore Open in April, outclassed Sakai, ranked 47th, 21-11 21-19 in just 37 minutes to take home a cheque of USD 75,000. But his rival also suffered because of similar unforced errors and the Indian led 6-4 early on. He consolidated his lead to reach 11-8 at the break. After the interval, Srikanth continued to dominate the proceedings. His net dribbles were better than Sakai and with Sakai struggling with precision, the Indian zoomed to a 19-11 lead and sealed it with two lucky net chord points. After the interval, Srikanth's aggressive game gave him the desired results. He turned the tables and caught up with the Japanese at 13-13 with an on-rushing smash at the net. The duo moved neck and neck after that till 19-19 before Srikanth produced two fantastic smashes to seal the issue and punch the air in celebration.